There is chance of storms Sunday, though they will likely be less severe and not as widespread as Saturday's storms. Expect some sunshine mixed in with the clouds Sunday, with a strong chance of showers and storms in the afternoon. Conditions will remain muggy. Monday, the area should get a break from the rain as low pressure pulls away. But the respite from the wet weather will be brief, with storms expected Tuesday. A flash flood watch is in effect for the Hudson Valley until 11 a.m. Sunday and there is moderated risk of rip currents at the shore. 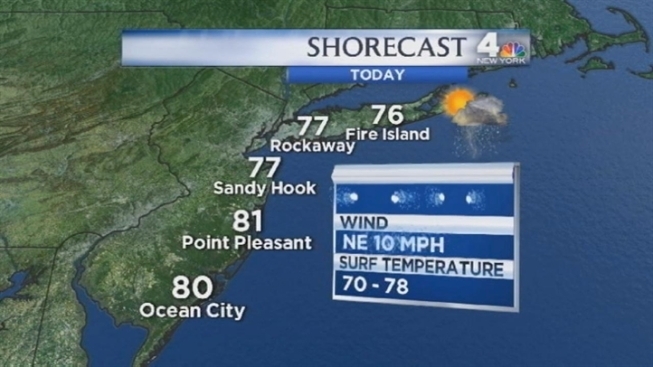 TODAY: Partly sunny, muggy and warm with showers/storms. TONIGHT: Mostly cloudy, an early shower/storm, mild. TUESDAY: Partly sunny with a few storms. WEDNESDAY: Partly sunny with a few storms. THURSDAY: Partly sunny with a few storms.